Could anyone give me some advice on how to feed a baby pigeon who's about three weeks old and may have been abandoned by his/her mum? She didn't come home today and so I'm a little concerned for him/her. Is it possible to mash up some oats to a liquid pulp to feed him/her, or could that cause problems? Secondly, can pigeon's fly in the dark because its possible she might come home tonight? Hi David, and welcome to Pigeon Angels! Three to four weeks is the age when babies start to eat solid food and to fend for themselves, especially as by then the parents will normally have another two eggs to sit. It's quite possible the parents of your little foundling have another nest elsewhere, and they may come back during the day to feed him, or they may not. If this is the first night he's spent on his own I wouldn't worry just yet, but if you are around during the day tomorrow keep an eye out to see if one of the parents comes to feed him. You could perhaps try to throw him some soggy bread, well soaked in water, to see if he already knows how to peck for food. - You can hand feed defrosted corn and peas. Run some hot water over them until they are defrosted and slightly warmed. Put the bird on your lap and hold it next to your body. I f it helps, you can wrap a towel around it or put it in the sleeve of a tee shirt, with the head out the wrist. That confines them without hurting them and makes it easier to handle. Gently open the beak and pop the piece of corn and peas at the back of the mouth and over the throat. You will need to feed 40-50 per feeding* and every time the bird’s crop empties until you know it is eating on its own. This is a wonderful method for teaching babies to eat because they feel the whole food in their mouth and it’s soft and easy to pick up and hang on to. The next step… seeds. The crop is located right below the throat and with food it fills up like a little balloon. The peas and corn make it lumpy and squishy. * He should have at least 100 per day. - For water, fill something cup shaped that won't tip over with water and gently place his beak in it without covering the nostrils. If he is thirsty he should start drinking. Leave the water with him so that he can go back to it if he needs to. - To teach a baby to pick up seeds, you can start with a bag of dove mix or small seeds and place a few in front of him. Then mimic picking them up with your thumb and index finger. He will become curious (they are curious little ones) and will start to mimic what you are doing. And before you know it he will be eating on his own. If he's not to be kept as a pet, it's best to avoid much interaction with him except for feeding and giving him water. He will also need a safe place in which he can exercise his wings until they are strong enough to fly. I hope this will help. Please keep us posted, and thank you for caring about this baby! I have just changed his bedding because it was really messy and I made up some Weetabix ,( A kind of Wheat based cereal ) with milk diluted by ten parts water and then blended into a liquid....I'll get some seeds tomorrow.. 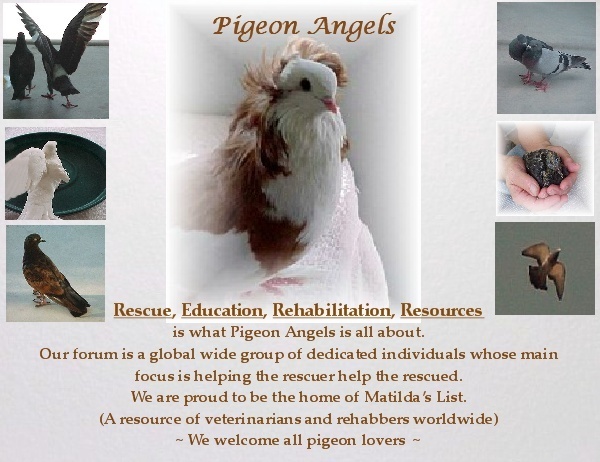 I would never of thought that there was a website like this until I needed one...Thank you so much for your reply and welcome..
My friends think I'm a bit strange because I actually care about pigeons and all creatures. I hadn't realised that you had already brought the little guy indoors, David. So he's got you wrapped round his little talon already, eh! Weetabix is a good idea (I'm rather partial to it myself, lol), but it's best just to mix it with warm water, as milk is something of a foreign substance to a pigeon. Yoghurt would be OK, though, especially live yoghurt, to provide him with some good gut bacteria. If the baby's droppings are very different from this, he may be unwell, in which case it would be a good idea if you could post photos of the youngster and his droppings. He's not inside Teresa but on my balcony.. I'll remix the Weetabix and put water in this time! 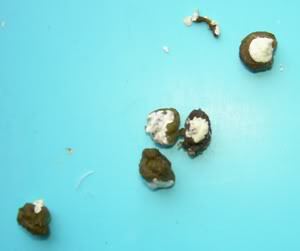 The droppings are identical to those in the image too! Thanks for being there in my hour of need, I really get upset at the thought of any creature suffering, whatever they are! I'll update the post tomorrow as its nearly bedtime for me here...Goodnight ! Many thanks for looking after the little one. Your confirmation on the droppings is a good sign. Pecking at you when you are changing his bedding is also a good sign, as it shows that for a feral Mom and Dad taught him well. Is there any chance of posting a photo of him? We love photos. Hope the little guy is doing well, David. Have mum or dad come back to feed him? ... but at his age, any deep, narrow container may look interesting enough for him to stick his beak right in and make an unholy mess! Tweety seems to be OK but as far as I can tell, Mum and Dad haven't appeared! Thanks for the additional welcome..
That's brilliant!! So she's still keeping an eye on him... That may mean he won't need much additional food. Hope the baby is doing well and growing up fast!